Image courtesy of Victoria Sgarro. LGBTQ asylum seekers in the U.S. currently suffer from a severe lack of attention and resources. AsylumConnect (a volunteer initiative that seeks to provide LGBTQ asylum seekers in the U.S. with lifesaving online informational resources) is trying to change that. 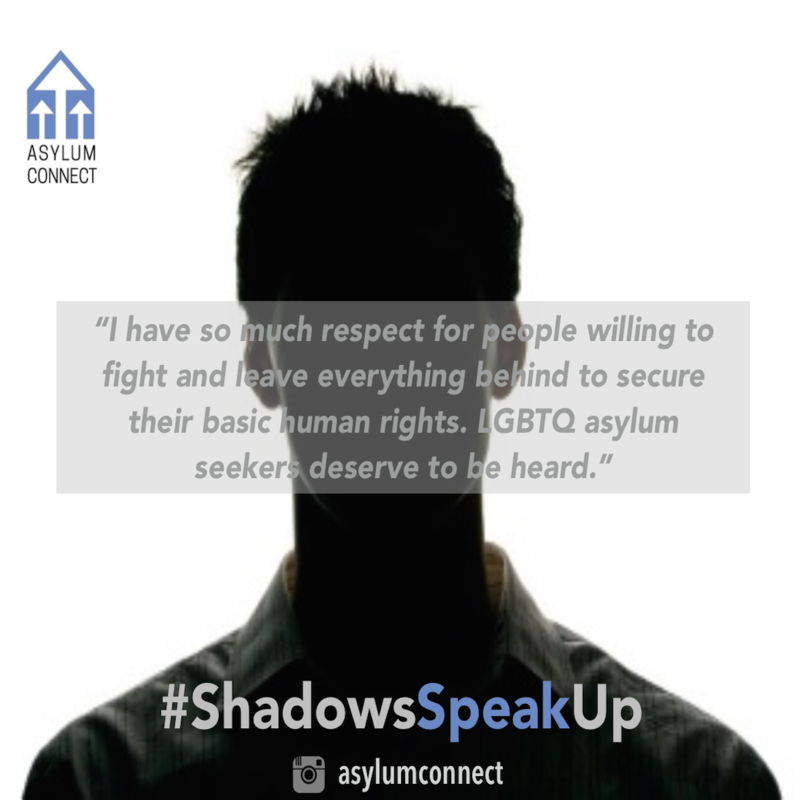 On January 15, 2016, AsylumConnect will launch the #ShadowsSpeakUp Instagram campaign to raise much-needed awareness for the 300,000 LGBTQ asylum seekers in the U.S. During the two-week campaign (January 15 - January 29), AsylumConnect will ask both asylum seekers and non-asylum seekers to take action through posting a picture of their shadow on Instagram with the hashtag #ShadowsSpeakUp. Participants are also highly encouraged to share their thoughts in the photo's caption on why people should care about raising awareness for LGBTQ asylum seekers. Sayid Abdullaev, AsylumConnect Co-founder/Co-director and a former LGBTQ asylum seeker himself, knew that in order for the campaign to be effective it must strike a delicate balance between visibility and safety. The shadows concept recognizes that even when they reach the U.S., it is unfortunately still dangerous for many LGBTQ asylum seekers to disclose their identities. The shadows concept allows for asylum seekers to participate fully in the campaign and to be heard without compromising their confidentiality. These people have incredible stories to tell. The Instagram campaign can cut through all the noise surrounding the global refugee crisis and bring awareness to LGBTQ asylum seekers. [This] is a cause worth fighting for. It means something to someone. And I'm sure that if we were in need, we would want others to fight for us. So now, we all have a chance to put an end to the killing and scarring of innocent souls. And all you have to do, is [post a picture] of your shadow. That takes nothing away from you but it does add everything to the cause. Most importantly, this campaign has enormous potential to generate awareness for those courageous individuals who have overcome tremendous trauma inflicted on them for simply being who they are. It is the unique opportunity to show solidarity for those who may not be able to show their faces but very much need to be heard. Harvey Milk used to comment that the most politically powerful thing a LGBT person could do was to come out. For much of American history, the LGBT community was an invisible minority and as such its needs were ignored. Cultural norms and legal barriers prohibited LGBT people from living their lives as they are for fear of alienation, persecution, or even death. Those same fears still exist for the millions of LGBT people that live in the 77 countries where their very existence is a crime. Join in solidarity with those voices who continue to be silenced by participating in AsylumConnect's Instagram campaign: #ShadowsSpeakUp. 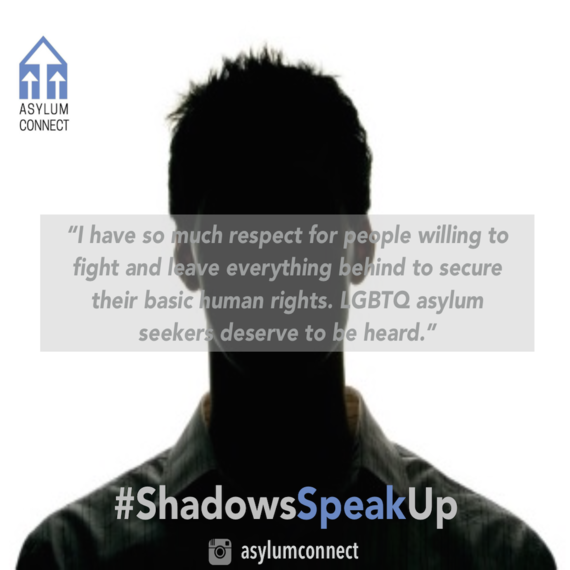 We are hoping that our photos, in particular the shadow photos, will be powerful images that will inspire people to become more active regarding issues surrounding LGBTQ asylum seekers. I, for one, have so much respect for people willing to fight and leave everything behind in order to secure their basic human rights. LGBTQ asylum seekers deserve to be heard. The question is: Will you hear them? Image courtesy of Mark (Northwestern University's student-run advertising agency). Join the campaign Facebook event page and follow @asylumconnect on Instagram to stay updated. Want to participate in the campaign but don't have an Instagram account? No problem! Email rose@asylumconnect.org a picture of your shadow with a brief description (e.g. Katie, 22-years-old, U.S.) along with your answer to the question: "Why do you care about raising awareness for LGBTQ asylum seekers in the U.S.?" And lookout for your submission to be featured on the AsylumConnect Instagram account.